We have been talking about the two methods to develop bodhicitta: the first method being the Seven-Point Instruction of Cause and Effect, and the second method being Equalizing and Exchanging Self and Others. To be specific, we’ve been talking about the first method, the Seven-Point Instruction of Cause and Effect. Therefore, we began by talking about the preliminary practice to that, equanimity. The first point, how all sentient beings have been our parents, specifically our mother; and second, have taken care of us the way our present life parents have; and third, developing a wish to repay that kindness. And then we spoke about heart-warming love and great compassion. Those are the fourth and fifth instructions. Today we are going to do the sixth one, the great resolve. Therefore, we’ve gotten through heart-warming love—seeing other beings in beauty and wishing them to have happiness—and we’ve also talked about compassion—recognizing others’ suffering and misery and wanting them to be free of that. Well, if you imagine you’re on the west coast, and you have a big beach in front of you, there are limitless grains of sand on that beach, right? You are not going to sit down and count them all. Are they all the grains of sand in the world? No. Okay. So it is similar. Somebody seeking liberation can have love and compassion for limitless beings, but that’s not all beings. Okay? Versus jumping in yourself and getting your nice clothes all wet and your make-up’s going to run and your after-shave’s going to wash off and everything. Do you see the difference between having the love and compassion and telling somebody else to do it and just giving of yourself and doing it yourself? Okay? As people who are trying to generate the Mahayana path, we want to have that great love and great compassion where we have the great resolve that we’re going to be proactive and do something about it. We’re not going to just sit on our meditation cushions and wish it, Okay? Nor are we going to be frenzied do-gooders in the world so that we mind everybody else’s business. But we are going to seek a proper and appropriate method to bring about happiness and eliminate suffering. Okay? The great resolve, the sixth point, is where we take responsibility for the welfare of others. Okay? And this taking of responsibility is done joyfully, it’s not taken as a burden. Sometimes the translation says, “I will take on the burden of liberating all beings,” but I think responsibility is a better word. All of these words have so many different connotations in English. But what the teaching is trying to do is make our minds strong, so that if we take on a burden/responsibility it doesn’t become a burden, so that if we take on a responsibility it doesn’t become an obligation. Do you understand what I mean? Okay. This is something done joyfully, it’s not like, “Oh, I have to liberate all sentient beings! How in the world am I going to do this? It’s too much!” But it’s like, “I am going do this!” You are really upbeat and optimistic about the whole thing. You are taking responsibility. There are two aspects to the great resolve. One aspect is great love and one aspect is great compassion. So when you say, “I, myself, will free sentient beings from suffering,” that is the great resolve together with great compassion. When you say, “I, myself, will bring happiness to sentient beings,” that’s the great resolve together with great love. Okay? My teacher, Zopa Rinpoche, often when he leads things, he’ll have us generate the motivation: “I, myself, alone, will liberate all living beings.” And at first your mind goes, “Who, me? I can’t even take care of myself—I can’t liberate myself—let alone all sentient beings.” So, this is what leads us to the next point of the actual bodhicitta because it’s true, when we can’t take care of ourselves, we can’t even liberate ourselves. In fact, we can’t even be sure that we are creating good karma to get a good rebirth. Then we realize, hey, as a limited being it’s hard for me to really fulfill this aspiration of great resolve. So what do I need to do if I want to fulfill this aspiration? So we look around and we say, Who’s best able to benefit beings and lead them to enlightenment? Who’s the most capable of it? Okay. Our mothers and our fathers and our teachers were kind, but can they lead others to enlightenment? No. Okay. So we can take them as a role model only so far. What about the arhats, those beings who are liberated from samsara, from cyclic existence, they’ve liberated themselves, but do they have all the qualities necessary to liberate everybody? Well, no. So who has, from their own side, the qualities necessary to do the greatest good and benefit? Do the bodhisattvas? Well the bodhisattvas have great love and compassion, but they still have imprints on the mind and obscurations on the mind, so they aren’t the most qualified either. They’re certainly better able than us, but not the most qualified. So who is it who has a mind that’s fully purified of all the obscurations and where all the good qualities have been totally developed so that they can spontaneously and effortlessly be of the greatest benefit in whatever situation they’re in? Who has that ability? We look around—that’s the ability that belongs to a Buddha alone. And so then we see that’s the reason we have to become fully enlightened Buddhas ourselves, so that at that time, there are no obscurations on the mind, so we have the full wisdom, okay? So we know exactly what to teach people about how to liberate themselves and break through the ignorance. A Buddha has the fullest development of compassion, so there’s no limit. A Buddha doesn’t get exhausted, they don’t get burnt-out, they don’t get tired, they aren’t concerned with any inconvenience that may occur with benefiting sentient beings. So, we want to become a Buddha so we have that quality of great compassion and that spontaneous joy to help. And, in addition, the Buddha’s have the skillful means to be able to do it. So, when one’s mind is fully freed of obscurations, then one is able to manifest an infinite number of bodies according to the karma of the sentient beings to be developed, that is, to be liberated or to be benefited. And that’s all done spontaneously, so you don’t have to sit there or wake up in the morning and think, “Well, who am I going to benefit today? Oh, they are five universes away. I don’t really feel like going there.” Instead, because the mind is not limited in any way, there’s just the spontaneous wish and together with that the ability to make a manifestation to be of specific benefit to others. So we can see that becoming a Buddha is the noblest goal and the one that’s going to enable us to do the most for all living beings. It is for that reason we generate the aspiration for Buddhahood. Okay? So you can see that to generate Bodhicitta we need to know something about refuge and the qualities of the three gems, the three jewels, so that we will know what kinds of qualities we want to develop ourselves, and we will be able to develop those. We can see that to generate bodhicitta, we need to have love and compassion so we need to see sentient beings as loveable and see their kindness and free our minds from partiality and develop equanimity for them. We see that to generate bodhicitta, we need to be very aware of our own dukkha—our own limitations and suffering—because if we cannot recognize our own suffering and wish ourselves to be free of it, how are we ever going to do that for others? So for this reason, we can see why all the other preliminary steps on the lamrim are necessary to really generate bodhicitta. We can see why an understanding of karma is necessary. If we’re going to liberate sentient beings, we’re going to have to teach them about cause and effect—what to practice and what to abandon. If we’re going to lead them to enlightenment, we have to teach them about the eight worldly Dharmas, the eight worldly concerns, and how they cause suffering and how to abandon them. Okay? So we see how all these other preliminary steps on the path are necessary in order to really be of the greatest benefit. So this is very helpful for us because it helps us to tie the various steps of the lamrim together. Bodhicitta has two aspects to it. Actually the definition of “bodhicitta” is “a primary mind with two aspirations.” One is the aspiration to benefit others in the greatest way, and the second is the aspiration to become a fully enlightened Buddha in order to do that. So there are two aspects of bodhicitta: one is the intent to work for the welfare of all sentient beings, and then the other is the aspiration, or the intent, to become enlightened so that we will have the qualities to bring about their liberation and enlightenment. This definition of bodhicitta is very important to understand because sometimes we hear, in Buddhist groups, that somebody does something nice and we go, “Oh, they’re a bodhisattva.” Well, it takes more than doing something nice to be a bodhisattva. Doing something nice is great! Okay. But it takes more than that. When we’ve studied this whole process of developing bodhicitta, we see how having all these attitudes is really necessary to becoming a bodhisattva. Also, when we are clear about the definition of Bodhicitta, it becomes much harder to lie to ourselves or to become arrogant in our own practice. Okay? Because sometimes we might meditate very well, and have enormous love and compassion for others, or after you do retreat you come back and you feel like you love everybody and it’s all wonderful. But then we have to ask ourselves, “Whenever I see a sentient being, do I have this spontaneous wish to lead them to enlightenment?” Ask yourself that question. “If, upon seeing that spider in my house, near my child, do I have the spontaneous wish to lead that spider to enlightenment?” And then you will see if you have actually generated full bodhicitta or not. Okay? And ask yourself the question, “When somebody talks behind my back, is my reaction one of total love and compassion and wanting that person to be free of suffering?” “Is that my attitude, spontaneously, without having to sit and think about it? If somebody driving under-the-influence accidently kills my dearest loved one, do I have the spontaneous wish to lead that drunken guy to enlightenment?” Then we see if we have generated full bodhicitta. Or ask ourselves, “Am I willing to give up my sleep to benefit sentient beings? Am I willing to give up my latte to benefit sentient beings?” And then you get a clue, because intellectually, “I can give up a latte to benefit sentient beings. But not the one I’m having today, the one I’m having tomorrow, I’ll give that one up.” Okay? [laughs] So it’s just helpful in this way. I’m not saying this so that we feel inadequate on the path, but so that we guard against being overly inflated. Okay? Because it is possible that we meditate and we feel a great deal of love and compassion, but unless we have full, complete wisdom in combination with this love and compassion, and complete self-honesty and self-awareness, there are all sorts of ways in which ego can deceive us. So we need to be very attentive to that. I say this warning because I’ve seen difficulties arising in people’s practice, and also because my teachers have also warned me and their teachers had warned them about arrogance and too much self-inflation on the path—thinking we’ve realized something when we haven’t. And even His Holiness the Dalai Lama says, when they teach the path in stages, they say that when you reach the path of seeing—there are five paths on the Mahayana path—and when you attain the third one, the path of seeing, they say that you can see 1,000 Buddhas at one time. So His Holiness tells the story of somebody who came in to see him who said, “I dreamt of 1,000 Buddhas. I must have attained the path of seeing.” And His Holiness said, “Well, it takes more than dreaming of 1,000 Buddhas, of seeing 1000 Buddhas in your dream, to indicate the path of seeing.” That’s just like one little kind of ‘perk’ that you get from the path of seeing, but that’s not the defining characteristic. So this person, although they had studied and they knew this was the quality of a path of seeing bodhisattva, they did not really understand well, and they thought they were further along than they were. Okay? So it’s always advisable to be humble. Bodhicitta, when we do develop it, it’s so liberating. Just sitting and imagining what it would be like to see a black widow spider close to your child and your compassion isn’t just for your child, but also for the black widow spider. You know, some sentient being who was born in that horrible rebirth, with totally no awareness of what’s going on, and they’re just trying to eat and they are just trying to not be squashed themselves, they do not know anything about karma, they are just trying to be happy and not suffer. And to be able to look at the black widow spider like that. Imagine the state of mind your mind would be, to have so much compassion not only for your child but also for the spider. That would be a really lovely state of mind, wouldn’t it? Don’t you think so? I mean, of course, you still save your child from the spider. It doesn’t do any good to the spider to let the spider bite your child, but you don’t have to squash the spider—you take it outside. You do not have to hate it or be afraid of it either. I find that very useful in my own practice. Just think, what would it be like to be totally free of anger? And what would be like to have a mind that isn’t easily offended, that isn’t attached to my reputation, so that I could walk into work and somebody could tell me about something I messed up on, and I don’t react with ego? What would that be like? Or what would it be like if somebody did the most horrible thing imaginable to me, and I could still react to that person by seeing him or her with affection? But still saying what they did was wrong. It does not mean that you say what they did is right. What they did is wrong, but you don’t get angry about it. What would that be like? Or what would it be like to have the thing that you want so much and crave right in front of you, but your mind isn’t all obsessed with it? Your mind is just tranquil because you already feel fulfilled. What would that be like? So I think imagining these kinds of things gives us a taste of—when we say we are aspiring for Buddhahood—what it is we are aspiring for. We bring Buddhahood down from being some kind of abstraction to something we can relate to in our life. So these are just a few of the attributes of a Buddha, okay, but it gives us something to start building and understanding of Buddhahood. 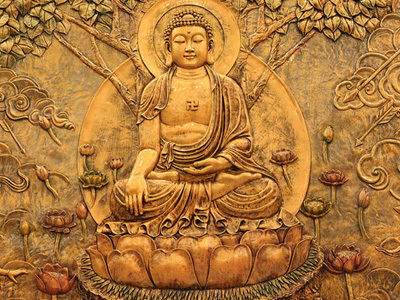 And it gives us a strong motivation to want to attain Buddhahood. Okay? So when we are looking at these seven points, the first three points—seeing sentient beings as our parents, specifically our mother; the second, seeing them as kind for having taken care of us as our parents; and third, wishing to repay it—these three are the basis for generating the aspiration to benefit sentient beings. They form the basis for generating that aspiration. Love and compassion, the fourth and fifth points, are the actual attitudes wishing to benefit sentient beings, because love wishes them happiness and compassion wishes them to be free of suffering. The two aspects of great resolve, the one that is together with great love and the one that is together with great compassion, these are the actual thoughts deciding to benefit sentient beings. So we can see the progression there, from having the basis for the aspiration, to aspiring to benefit them, to deciding to benefit them. Those are the six causes. Then the effect, the seventh in the Seven-Point Instruction, is bodhicitta, and that is the actual wish, that has the two aspirations, or the two aspects. One is the intent to benefit others, to work for their wellbeing; and the second is the aspiration to attain enlightenment to be able to do so. Okay. So bodhicitta is the effect in the Seven-Point Instruction on Cause and Effect. And the first six are the causes. So can you see that as we have gone through these steps how it’s a gradual development of our mind? When you spend some time meditating on these, you can see how one relates to the other, how the latter steps depend on the former, how the former steps lead you to the latter; and if you really spend some time thinking about these things, you’ll see a change in your mind. Definitely. If you just listen to the teaching and take notes, and know the seven points by heart, that’s good, but you’re not going to taste it. The way to really taste it is to sit down and do these meditations and contemplations like I’ve been describing. So it’s like the difference between studying about chocolate, and having a bar of chocolate in your pocket, and actually eating it. Studying about chocolate, you know all about chocolate, you know how chocolate is made; you can give a whole discourse on all the causes leading up to chocolate. You even have a bar of chocolate in your hands. You can give a beautiful teaching on it. You have so much devotion and love for your bar of chocolate, but you don’t eat it. Okay. That is the difference between hearing about all this stuff and actually sitting down on a daily basis thinking about these meditations. So eat the chocolate! [laughter] And bodhicitta is better than chocolate. And it doesn’t give you high cholesterol and make you fat, either. So that’s the Seven-Point Instruction for Cause and Effect. Yes? So that’s one of the methods for generating bodhicitta.